Theresa May will have the opportunity for an extended discussion with Boris Johnson about his views on Brexit when the pair share a seven-hour flight back to Britain from New York. The Foreign Secretary had been planning to return separately from the United Nations General Assembly, but Mrs May’s official spokesman confirmed that he would now join the Prime Minister on her RAF Voyager jet on Wednesday evening. 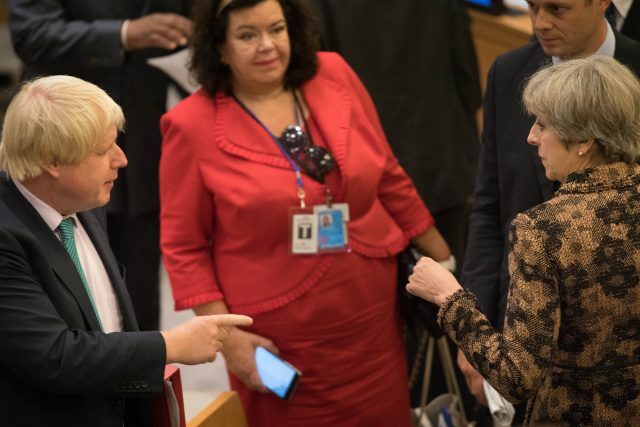 Mrs May and Mr Johnson met on Tuesday night for the first time since Mr Johnson published an explosive personal Brexit manifesto, when both attended a reception for Commonwealth leaders at the UN. The PM’s spokesman gave no details of any conversation that the pair had at the event. 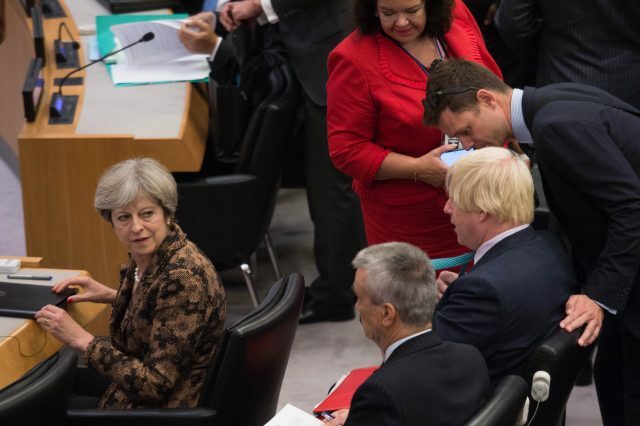 Mr Johnson’s Telegraph article on Saturday has overshadowed Mrs May’s three-day visit to the US and Canada in the run-up to her crucial Brexit speech in Florence on Friday. The Foreign Secretary was forced to deny he was planning to resign, while Mrs May faced calls for her to sack him from her Cabinet. But the threat of a damaging outcome to the bust-up receded as Mr Johnson backed away from his key demand that the UK should cease payments to the EU after the date of Brexit in 2019. In an interview with The Guardian, he conceded that Britain must “pay our dues” during any transition period, as well as meeting financial demands “where our lawyers say we are on the hook for stuff”. Reports suggest Mr Johnson and other hard Brexit-backing ministers have been squared off over Mrs May’s plans to offer the EU some form of payment to break the deadlock in negotiations. But Downing Street described as “speculation” a Financial Times claim that chief Brexit “sherpa” Olly Robbins, who moved on Monday to a role reporting direct to Mrs May, had told Germany she will offer to pay £20 billion in the period up to 2020 to cover gaps in the budget left by the UK’s departure. Speaking in New York, one of the Government’s most enthusiastic Brexiteers, International Development Secretary Priti Patel, insisted the Cabinet was “united behind the approach of Theresa May”. Ms Patel told Sky News: “I’m for Brexit and that’s what the PM is trying to achieve – she’s been clear, the Cabinet is clear that we want best deal for Britain. Mrs May has called a special meeting of Cabinet at Number 10 on Thursday to discuss the following day’s speech in Italy, which Mr Johnson is due to attend. Speaking to The Guardian, the Foreign Secretary declared himself “mystified” by the response to his 4,000-word essay, pointing out that his critics had accused him of remaining silent on Brexit. “So I contributed a small article to the pages of the Telegraph, and now everyone who had previously accused me of saying too little are now saying I am saying rather too much,” he said. Mr Johnson conceded that the UK should make contributions for access to the single market during the transition, but not after. He said: “I don’t think the sums should be too high, but it is obviously legitimate and right that we should pay our dues – we are a law-abiding country – during the period of membership. “Where our lawyers say we are on the hook for stuff, then we are going to have to pay.